Natural Shaving Oils: This is a teeny tiny bottle that contains natural oils that make shaving a lot easier and your skin smoother. Nick Stick: Nicks are an inevitable consequence of shaving. But you can minimize bleeding and help soothe your skin with this stick that contains vitamins A & E and Aloe. Shaving Cream: This is an organic cream made of a low-lather formula that will help make your skin hydrated and smooth. 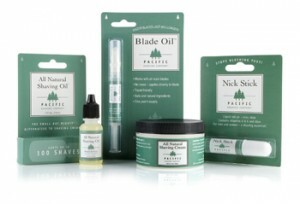 Blade Oil: This oil was made to protect your blade between shaves. This avoids nicks and cuts because it will stay in a better condition for more time. The first thing I loved about this product and what got me interested in it is that it is eco friendly. Plus in their website they say that for every bottle sold a tree is planted. Another big plus for me is that the bottles are so small that they fit easily in any hand bag or toiletry bag I take on my trips. Then there is the fact that their products actually work. My husband started using it as soon as we got it and he loves them, especially the shaving cream. Out of curiosity I decided to try them on my legs, just as they say on the website I used the shaving oils under the shaving cream and loved it. My legs felt so smooth that I haven’t been able to stop using it. The one product I wasn’t sure about was the blade oil. But after using it on the blade after shaving and after cleaning it I noticed that it actually took some more time before replacing it. This product prevented a lot of nicks but whenever we do get them we use the nick stick. It really helps to soothe our skin. The only down side I could find is that some people might have a hard time getting used to using cream or oil instead of the regular shaving foam. Join them on Facebook or follow them on Twitter for more info about their products. This entry was posted in Beauty Products, Eco Friendly Products, Men's Products, Product Review. Bookmark the permalink. Great little article, love small shaving containers that are ideal for travel. Love that a tree is planted for each bottle sold.